Reviewers liked it more than viewers, which is unusual for action films, where it's usually the other way around. We saw it in IMAX (which added no real value). 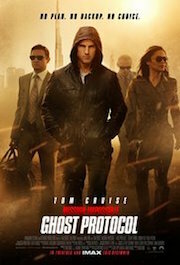 It was good actions, interesting scenery, completely implausible stunts, over the top plot, in other words, a Tom Cruise / Mission impossible film. A lot of action, but it didn't make me nauseous in IMAX like some shakey-cam stuff can. So if you liked the first ones, you'll like this one a lot. It was the best of the MI's for me. As a friend worded it, the original MI show, and the first MI movie was "here's a team of highly talented professionals, getting the job done." Every subsequent one became more and about, "Look at me, I'm Tom Cruise/Ethan Hunt." In some ways, that works: it's easier to follow a single character than the complexities of an ensemble cast and complex caper. But what the lacked in implausibilities of timing, they make up for in implausibility of one-man stunts. He does subtlety like driving around in a BMW prototype I8 with glowing blue Neon, and pretending to be playing it "low key". If you like the absurdity of older James Bond films, then you'll love this. If you caught yourselves ever saying, "Oh, come on"... then you probably won't fancy this flick either. My wife liked it more than I do, but she likes the MI series. Still, it was a watchable action film. This was a cap, to a bad year for Hollywood. I think I like Kings Speech and Hugo. But the majority was tripe and finale's to series like: Friends with Benefits, Bad Teacher, Big Momma 4, and so on. Which is fine if you need closure to the Twilight or Harry Potter Sagas... but aren't really things you'd want to be remembered for making (or recommending).